Propolis is a complex resinous mixture produced by honeybees and used in the construction, repair and defence of hives. Humans have used propolis in traditional and alternative medicines since ancient times. Subject of intense research, propolis showed to possess many biological and pharmacological properties, namely antimicrobial and antioxidant1. Although clinical studies are still lacking, the broad bioactivities spectrum of propolis, the continuous discovery of new compounds, its long history of use and safety profile suggest promising applications in medicine and pharmacology. The increasing public interest towards natural pharmacological compounds, along with propolis wide antimicrobial activity and synergy with antibiotics, give additional stimulus to propolis research. Portuguese propolis has deserved little attention by the scientific community2,3 making fundamental to study its chemical fingerprints and biological properties. In this work, we present some of the results obtained for Portuguese propolis showing that it is likely to be an important source of valuable bioactivities: it confers antioxidant protection, has antigenotoxic effects, displays broad antimicrobial activity, is cytotoxic against some human carcinoma cells, has anti-inflammatory potential and exhibits phytotoxicity against in vitro flax plants. Such results not only confirmed some widely known propolis activities but also suggested new ones for Portuguese propolis, envisaging potential for several clinical, industrial and environmental applications as well as for its valorisation. Acknowledgments: To FEDER/COMPETE/POCI– Operational Competitiveness and Internationalization Programme, under Project POCI-01-0145-FEDER-006958 and FCT - Portuguese Foundation for Science and Technology, under the project UID/AGR/04033/2013. ISNAD Cunha, A , Alves, H , Araújo, C , Barroso, L , Cruz, M , Freitas, AS , Gomes, AJ , Gonçalves, R , Marques, R , Moreira, B , Passão, C , Peixoto, M , Pereira, H , Silva-Carvalho, R , Valença, I , Ferreira, AM , Baltazar, F , Pinto-Ribeiro, F , Cardoso, S , Oliveira, R , Almeida-Aguiar, C . "Portuguese Propolis: A Source of Valuable Bioactivities". 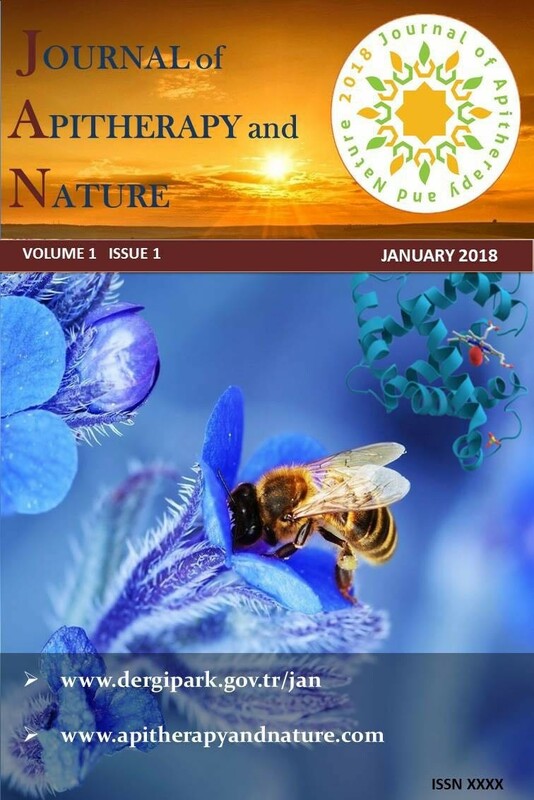 Journal of Apitherapy and Nature 1 / 3 (December 2018): 27-27.